The Halle network used to connect the northern district of Trotha in a U-shaped route through the main train station with the residential suburb of Halle-Neustadt on the western bank of the Saale and then on to the last stop Halle-Dölau. Meanwhile the track section from Halle-Nietleben to Halle-Dölau has been abandonded. The Leipzig route network started northward from the main train station (a terminal station) going around on both sides of the city and joining in the south in Markkleeberg. This distinctive heart-shape was driven as a circular line in both directions, which ran to Gaschwitz in the south. Later lines were built out to Wurzen in the east and Grünau in the West. On 29 February 1968, the Leipzig Bezirk government decided to build an S-Bahn network. Already at the spring trade fair, the "S-Bahn-style rapid transit" system was demonstrated between the main station and the newly established Messegelände (Exhibition Center) stop. By 12 July 1969, the S-Bahn network was expanded to the entire heart shape, in order to cope with traffic volume of the 5th East-German Gymnastics and Sports Festival (German: Turn- und Sportfest der DDR). The two branches were named S1 and S2. For the first two days the trains were free, which led to overcrowding. The fare then set absurdly high, with a single ride costing 50 Pfennig, a short distance ride up to five stations costing 30. Changing to transportation run by the of the Leipziger Verkehrsbetriebe (LVB), or motorized transport required a new ticket, although combined monthly tickets were issued. In contrast, a single ride ticket in the city of Berlin (with transfer) only cost 20 Pfennig and the rides on the LVB could be as low as 16.7 Pfennig, with the use of multiple-ride cards. Although dense suburban traffic between Leipzig and Halle had already existed for decades (from 1928, powered coaches and later series ET 41 ran on this route), a special tariff was never introduced on the line. 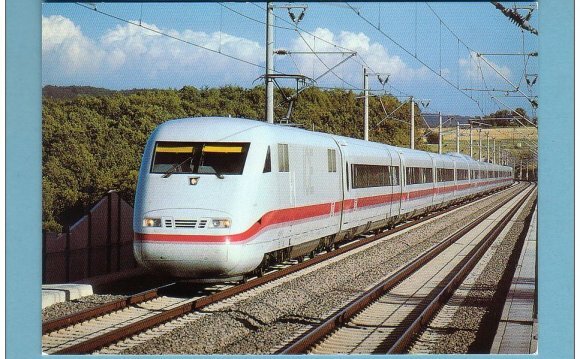 On 19 March 2002, construction work began in Halle for the new commuter train route between the two cities. The commissioning of the 234-million-euro project was planned for December 2004. The construction costs were raised primarily by the German federal government (135 million euros) and the states of Saxony-Anhalt (39 million euro) and Saxony (34 million euro). The project was successfully completed on schedule on 12 December 2004. In Leipzig, the route leads from the main station directly over the original route used for the decades only by freight trains of the Magdeburg-Leipzig Railway Company to Leipzig-Wahren. The existing RegionalBahn line 56 via Wiederitzsch was replaced by the S-Bahn line. As a result, the travel time of 36 minutes is unchanged, despite five stops being added. Since the 5 December, the RB 56 route has been reactivated in a trial run with passengers. In addition, the RegionalExpress line 5 trains took over the role of an "Express S-Bahn" which has run since 30 June 2003, in a special hourly service to the Leipzig/Halle Airport. It was not necessary to introduce a special tariff because of the existence of the Mitteldeutschen Verkehrsverbundes since August 2001. In the times of the GDR, Leipzig had three lines designated A, B and C. These were later changed to S 1, S 2 and S 3. The S 2 line (known as the "Forest Railway") was shut down in 2002. The S 1 line was then in 2004 divided into the lines S 1 and S 2 so that the platform ramps in the tunnel do not have to cross unnecessarily often. In 2009, the operation of the line that runs eastwards from the Leipzig main station was awarded to the Mitteldeutsche Regiobahn thus effectively reducing the size of the S-Bahn network. On the routes concerned, the timetable did not change. Because of cost cutting, the remaining S 1 line between Leipzig Miltitzer Allee and Leipzig Hauptbahnhof was cancelled on 30 April 2011. As a replacement, two bus routes as well as additional tram services are being offer by the LVB. The S 1 line was to be reopened with finishing the City-Tunnel Leipzig and opening the new S-Bahn Mitteldeutschland network in December 2013. The former lines S 2 Leipzig Hauptbahnhof – Borna (– Geithain) and S 11 Leipzig Hauptbahnhof – Wurzen (– Oschatz) had been operated since 2009 by Mitteldeutsche Regiobahn (MRB) as lines MRB 2 resp. MRB 11 and were therefore not officially designated as S-Bahn routes any more. On weekend nights only, DB run a few services on the line 11 as S 11. The main construction project for the new central German S-Bahn network was the City Tunnel in Leipzig. It will cost about 960 million euros (as of January 2010) and will form the main route that the S-Bahn lines S 1 to S 5 will take through the center of Leipzig. The tunnel crosses through the city for a length of 3.9 kilometers and is up to 25 meters deep. Four stations were built along the tunnel: Hauptbahnhof Tief (a "deep" section of the main station), , and as well as the station where the tunnel surfaces in the south.